Synopsis: Tory Brennan, niece of acclaimed forensic anthropologist Temperance Brennan (of the Bones novels and hit TV show), is the leader of a ragtag band of teenage “sci-philes” who live on a secluded island off the coast of South Carolina. When the group rescues a dog caged for medical testing on a nearby island, they are exposed to an experimental strain of canine parvovirus that changes their lives forever. 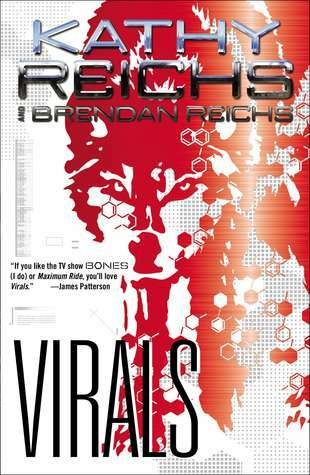 Review: I’m in love with the TV series, Bones, and have read one of Reichs books that pertains to that series ages ago and loved it so when I saw that she now had YA novels I had to pick them up. The Characters – Other than Tory, we got little personality from the rest of her cohort and from the other far off secondary characters. It was also hard to believe that she could move from Penn to Charleston and live with her father she never knew about after the death of her mother and we get no emotion or feeling from that. As a 14 year old girl I think she would be super affected by that. So she’s a little unrealistic there. Also, the fact that she’s a genius and skips grades and also pretty and attracting to popular boys at school while being bullied by the popular girls were also unrealistic to read about. Where are her flaws? The Plot – The plot was interesting. It definitely had some faulty elements. I get that she’s supposed to be the niece of Temp Brennan but there’s no way she could have gotten the clue the way she did and for it to have work. Like the GoogleMaps thing… really? I hope this virus that caused them to mutate into these beings is explained more in the sequel as I found it wasn’t truely explained. I mean it was, but I want the science behind it. Regardless, I do find these books to be a good fast read. A nice mystery type novel for the younger readers. The Writing – I was disappointed with the writing as I loved her writing in the Temperance Brennan series. But this was choppy and they really need a better proofreader/editor because there was a lot of mistakes. For instance at one point it should have read “They went” but it said “The went”. Things like that had popped up multiple times throughout and my eyes always catch those sort of things causing me to re-read the sentence over and over making me think maybe I’m reading it wrong. I’m hoping the series gets better with the sequels and it gets a little bit more believable! This entry was posted in book review, book reviews, review, Uncategorized and tagged book review, kathy reichs. Bookmark the permalink.